TORONTO (AP) DeMar DeRozan spent his New Year’s Day watching basketball history and making some, too. 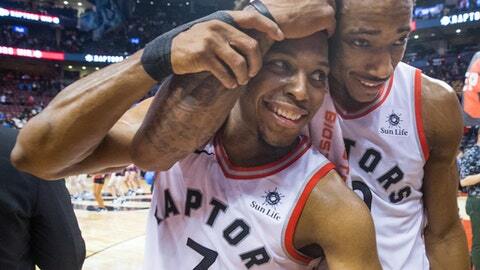 ”I for sure wanted to beat T-Ross,” DeRozan joked about eclipsing his former teammate. DeRozan scored the first nine points of the game and had 21 in the first, the most by a Raptors player in a single quarter this season. DeRozan made 17 of 29 field-goal attempts and went 13 for 13 at the free-throw line. His five 3-pointers were one shy of his career high. Kyle Lowry had 26 points and Serge Ibaka added 11 for the Raptors, who also won 12 straight at Air Canada Centre between Jan. 18 and March 6, 2016. Toronto is an NBA-best 14-1 at home. Eric Bledsoe scored 29 points, including 11 in overtime, and Giannis Antetokounmpo had 26 for the Bucks, who had won their previous two. Khris Middleton finished with 18 points in the entertaining rematch between first-round playoff opponents from last season, a series Toronto won in six. After blocking Bledsoe’s fast-break layup attempt in the first, Ibaka celebrated by pointing at the Milwaukee bench. Bucks: Host Indiana on Wednesday. It’s the first of four meetings this season between the Central Division rivals. Raptors: Visit the Bulls on Wednesday. Toronto has lost six straight in Chicago, last winning there on Dec. 31, 2013.